Are you planning a move? Moving can be a stressful event that takes you months to recover from, or a good experience that brings you closer to your goals in life. The difference between a good move and a stressful move is usually the level of preparation you put into it. While there are a certain number of variables in any move that can’t always be controlled, most things can be planned for to ensure a stress-free move. Here are the 6 top moving tips to simplifying your move. 1. Plan Expenses — Budget your move two months in advance. Take the time to figure out a moving plan and determine how much you will need to spend. Are you renting a truck? Will you hire a moving company? How much moving help will you need to hire? How many days will you need to take off work? Will there be travel, airline, hotel, or other expenses you need to plan for? 2. Sort Your Belongings — Many of the items in your garage, closets, and attic may no longer be necessary in your life. If your child is married, his old bike can be tossed. Hobby equipment you haven’t used in more than 3 years can also safely go. You may come across items you want to keep safe, but you don’t need on a daily basis (like boating equipment, or golf clubs you’re saving for your retirement next year). 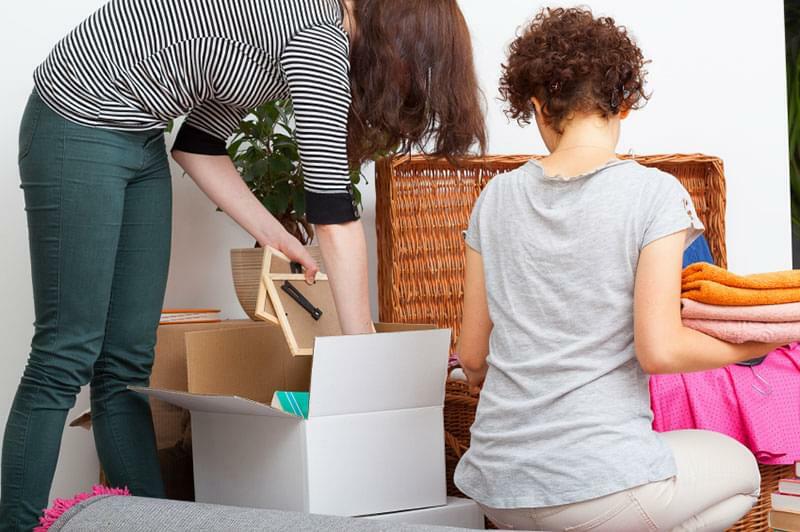 Keep these items in an extra closet or rent a secure storage unit nearby, so they don’t get lost, misplaced, or accidentally tossed during the move. 3. Schedule Help — Whether you’re hiring a full service moving company, or you’re just hiring a few extra hands for the afternoon, you want to schedule moving help as far in advance as possible. Many people don’t realize they’ll need help until the last minute, and it’s hard to find reliable moving helpers close to your moving day. If you’re asking friends or family to help you move, ask several weeks in advance and have them confirm as soon as possible. That way, if you don’t have enough “free” help, you’ll still have time to hire some help for your move. 4. Use a Storage Unit — If possible, move as much of your stuff as possible into a storage unit a few months in advance. If you are selling a home, this step will give you two advantages. First, having fewer belongings makes your house sell quicker, since it looks cleaner and more spacious. Second, if you’ve moved a lot of stuff ahead of time you’ll have much less work on moving day itself. 5. Begin Packing Early — Don’t leave all the packing for the week of the move. Unless you’re in a very small apartment, with few belongings, you’ll need several weeks to pack. If you schedule it out over several weeks, you won’t have to take as much time off work for your move. Plan to pick up takeout or fast food on packing days, though, as mealtime preparation usually goes on hold. 6. Relax — The hardest part about moving for many people is the upheaval process. The loss of social support from moving to a new city combines with unrealistic expectations we place upon ourselves to be all moved in within the week, and all this adds up to a lot of stress. It will take you several months to settle comfortably into your new home, even if you hire a full service moving company. Once you’re moved into your new place, you might feel tempted to do nothing but unpack and organize for weeks on end. While you do need to get things organized in a timely fashion, you also need to recover from the stress of the move. You will adjust better to your new place if you’re well rested and if you’ve taken some time to get to know your new city and your neighbors. Nobody wants a terrible move. The worst moving experiences typically involve damaged belongings, unexpected expenses, and scheduling delays (either in moving out from your old place or in moving in to your new place). You can prevent this when you plan ahead, schedule help, reserve a moving truck, and get a storage unit ready. Did you know you can get free moving truck rental at Value Store It? Minimize stress by renting a safe, secure storage unit to hold your belongings during your move at Value Store It, with locations in Florida, New York, and Connecticut. Contact us to reserve your storage unit and simplify your next move.